My warface is a Max Payne-style smirk with a hint of Nicolas Cage crazy-eyes. Crytek's Warface, however, is a CryEngine 3-based free-to-play war shooter. The game, which is curiously not called "WarCry," is currently live in Russia , and we've been hearing for a while that it'll come our way soon -- probably before the end of the year. Browsing the English website tells me that Warface is about class-based war guys doing war stuff in PvE and PvP matches, sometimes involving a mechanized Kool-Aid Man (see trailer). It lights up the part of my brain that deals with using rusted car shells for cover (the Call of Duty lobe), but that's a surface-level impression. I decided to go deeper, so I went to Russia. Well, not really, but I went to a Russian website to download Warface and try it for myself -- ping-be-damned -- and you can too. The first step is to register for an account at wf.mail.ru and download the client. This part is pretty intuitive: all you need to enter is an e-mail address, password, nickname, and captcha. There's always Google Translate , if needed (though the registration process won't work while the site is in a frame). Once the client is downloaded, it does its thing with minimal guess-clicking. For me, the game downloaded at a reasonable 350Kb/sec. The first time I launched Warface it prompted me to name my soldier. This was the first hurdle: I could only enter numbers with my English keyboard layout, and it didn't want to accept "1230001010" as an alias (nor would it take "80085"). No problem: in Windows' Control Panel, under Region and Language > Keyboards and Languages, add Russian as an input language. Now you can кириллица all day! Change your default language to Russian and launch Warface. I commonly use "Bender" as an alias, and through some trial and error, I typed out "клещи," which translates to "mite, tick, pliers, pincers, etc." Eh, close enough. Once you've done that, you can disable Russian input, or at least set English as the default again. Once you're in, you'll be prompted to start the tutorial. I accepted (the left option is Accept), and succeeded with some trial-and-error. I noticed an annoying flicker in the backdrop, so I opened the options (the gear icon) and checked the graphics settings (Графика). I discovered that "Полноэкранный режим" means "full-screen mode," and disabling it turns off vsync, removing the flicker. I later translated the menu and found that vsync is the third option, so that's the one you want to go after if you have problems (unless you want to play windowed, either works). If you want to adjust the graphics quality, it's under "Качество." I selected "Высокое" (High) -- the quality diminishes from left to right. Every PvE lobby I entered was disbanded -- I guess no one liked the look of my ping, or maybe they don't often play with ticks -- but it was easy to get into a PvP match. The server browser is just like every other you've seen, and despite the angry red color of my connection bars, everything ran smoothly. The flashes of Call of Duty 4: Modern Warfare I saw in the trailers weren't wrong -- there are similarities -- but I think CoD's hugeness makes it easy to over-compare any modern or near future-themed war shooter. 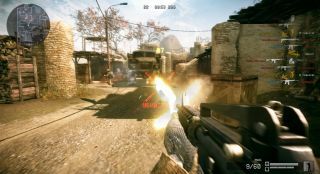 Warface has a little Counter-Strike in it, too, and definitely some Crysis 2 (the slide maneuver is an obvious carryover). The only other PvP mode I played is free-for-all. I spawned in a stream running through an evergreen forest, which suggested that this was a larger map. There were fewer squared-off corridors, but it wasn't large -- every corner I sprinted around put me in someone's line of sight. How will Warface fare out west? In the face of colorful F2P shooters like Tribes: Ascend, Team Fortress 2, Super Monday Night Combat, and PlanetSide 2, it's easy to label Warface "generic." I can point out that its character animations are fantastic, or that its hitboxes seem flawless, but it lacks a distinct hook. It looks like other war shooters, and so it will be judged alongside them. I was pleased to find, however, that I can still enjoy a straightforward assault rifle vs. SMG vs. sniper rifle vs. shotgun dynamic, even if it's among the corrugated shipping containers I've already spent so much time lurking behind. There are a lot of people playing Modern Warfare 3 multiplayer every day (34,150 on Steam at the time of writing), and Warface is an alternative with fewer power chords and less kill streak clutter. It has its own ideas, too, such as a teamwork lift maneuver that requires players to work together, and there's the co-op PvE I haven't played yet. If you're more patient than I am, you can sign up for the English closed beta at the official site . On the way, you'll run into one thing that has to change if Crytek and Trion want to convince anyone: the phrase "AAA4Free social FPS service." Yuck.